The 2018 Lexus LS, which premiered in Geneva, is set to go on sale sometime in the third quarter. 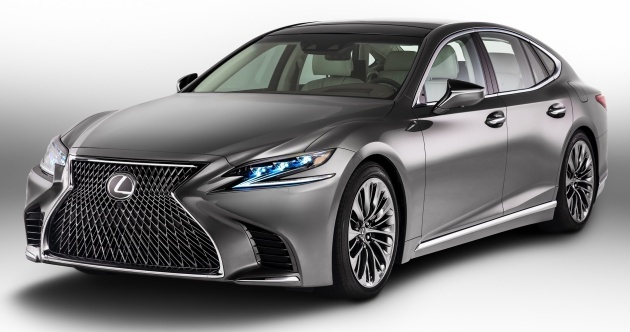 The Multi Stage Hybrid System in the LS 500h has already been fleshed out, and now the automaker has outlined the safety performance of its flagship, which will be equipped with a Lexus Safety System + and Lexus Safety System + A. 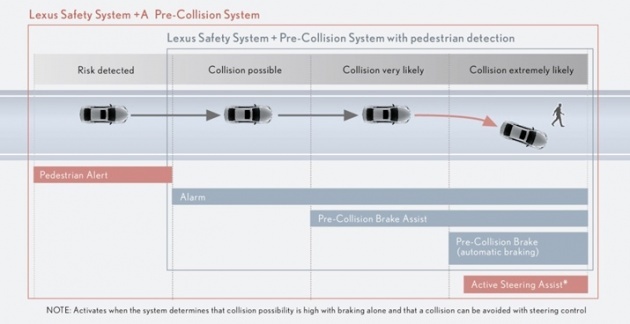 On the fifth-gen offering, the existing Lexus Safety System + active safety package – which is based on the Integrated Safety Management Concept – has been combined with Lexus Safety System + A, which provides advanced pre-collision support and sophisticated driving assistance. The Lexus Safety System + already packages Pre-Collision System (PCS) with pedestrian detection, Lane Departure Alert (LDA), Lane Keeping Assist (LKA), Automatic Hi-Beam (AHB) and Dynamic Radar Cruise Control under one umbrella, though the company says performance of these have evolved. The PCS, which uses a millimetre-wave radar and a stereo camera can now detect bicyclists and nighttime pedestrians and has improved deceleration performance during automatic braking. For example, it can decelerate the vehicle by as much as 60 km/hour when a pedestrian is detected, thus improving its collision-prevention performance. As for LDA, in addition to detecting road lane lines, it’s now also capable of detecting the boundaries between asphalt and such elements as grass, dirt and curbstone through advances in recognition capability, offering continued performance on roads that do not have lines. The introduction of the + A group adds on a host of items to support even safer and more-secure driving in a broad range of situations. New items include pedestrian alert and Active Steering Assist being added in to the PCS. Pedestrian alert specifies the direction of the presence of a pedestrian ahead, and if there’s the possibility of collision, the direction of the pedestrian’s presence is shown in an animation via the LS’s large color HUD, contributing to intuitive recognition on the part of the driver. As for Active Steering Assist, if it’s determined that a collision with a pedestrian in the lane of travel or with a continuous structure (such as a guardrail) is imminent, and avoiding that collision is impossible with brake control alone, automatic steering control is activated on top of the brakes being applied. Lexus CoDrive, meanwhile, assists the driver in maintaining in-lane driving or in changing lanes. It adds Lane Change Assist (LCA) and Lane Tracing Assist (LTA) to the basic functions of Dynamic Radar Cruise Control. These are aimed at providing steering and lane-changing support on highways or motor-vehicle-only roadways, and is coordinated with the LS’s large HUD and multi-information display to clearly notify the driver of the state of support that is being provided. The LTA provides lane-keeping support by way of steering control when Adaptive Cruise Control (ACC) is in operation. Aside from lane line detection with the help of the camera, the system traces the path of a vehicle ahead to continue assistance even when lane lines cannot be recognised, with steering control based on the path of the vehicle ahead. If the speed entering a curve is found to be too fast (based on navigation data), the driver is alerted by way of the HUD and multi-information display, and the vehicle is automatically slowed down. As for LCA, the manual use of the turn signal provides a cue to activate it. It supports lane changes by monitoring the surrounding road environment and, at the appropriate timing, controls steering, as well as acceleration and deceleration. There’s also Driver Emergency Stop Assist, which is coordinated with LTA. If the system senses a lapse from the driver beyond the ordinary during use of LTA on a roadway, the system supports the driver through audio and visual alerts as well as gentle deceleration. If there’s still no driver input, the system then activates the vehicle’s hazard lamps and horn to alert other traffic, while slowing and eventually stopping the vehicle within its lane before unlocking the doors and activating an automatic Helpnet connection for a rescue request. The + A system also includes Front Cross Traffic Alert (FCTA), which like its rearward sibling is meant to detect cross-traffic vehicles, but in front. Utilising the front radar, it signals the driver to the presence of a cross-traffic vehicle approaching the immediate intersection. Alerts are initially issued via the HUD, and if the vehicle proceeds regardless of the presence of an approaching vehicle in cross traffic, warnings are also issued by a buzzer and the LS’s multi-information display. The new LS will also feature a two-stage Adaptive High-beam System (AHS). Utilising eight LEDs at the top and 16 below on each side, the system provides optimal lighting by way of separate on/off control of each row of LEDs, enabling finer control of light strength and distance compared to the existing AHS and offering a higher frequency of high-beam driving without impeding on preceding or oncoming vehicles. There’s also Road Sign Assist (RSA), which acquires road sign information using the on-board camera as well as navigation maps, displaying these via the HUD and multi-information display. Other active safety technologies that will be found on the new LS include parking support brakes. The car features a low-speed braking support system that groups Intelligent Clearance Sonar (ICS) and Rear Cross Traffic Auto Brake (RCTAB) along with a new rear pedestrian support brake. The car will issue an alert if a pedestrian is detected via the rear view camera while backing the car up, and apply automatic brake control if needed. Side clearance view and cornering view functions have also been added to the Panoramic View Monitor. The area in front of the car is produced as an image on the LS’s 12.3-inch display monitor, allowing the driver to more-intuitively confirm the space on the sides of the vehicle when passing by another vehicle on a narrow road or confirming the distance to a road shoulder, enhancing safety and unnecessary kerbing. Lastly, the car will feature a digital rear-view mirror. A built-in display in the rear-view mirror displays an image captured by the rear camera, making rear safety checks possible independent of conditions (obstruction by rear-seat passengers or rear-screen sunshade, if in operation). A lever switches the display between optical mirror and digital mirror mode.